DO NOT UPDATE to iOS5 if you use Ancestry APP or CAMERA APP ! On the Mailing List: ANCESTRY-TREE-TO-GO-APP , people have been complaining that Ancestry APP does not work. Now Stanczyk knew it worked and it worked well … But that was BEFORE iOS5 came out. I confirmed the problem exists on iOS5. It does not download the tree / GEDCOM properly (you get a synch error). If you had a previously downloaded a tree (before iOS5) then you can use that tree. 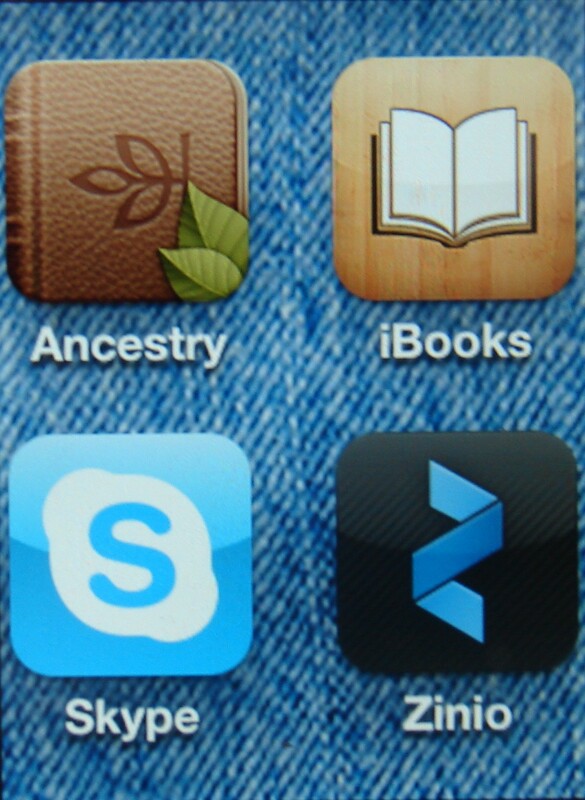 Obviously any changes made on ANCESTRY.com will not be able to synched to your iPhone/iPad. HOWEVER, if you update your family tree on the iOS5 device, then your changes can be synched in that direction and saved on the Internet and accessed at Ancestry.com. In fact, after you do that you can then get around the above problem. But you had to have a tree on your iOS device BEFORE you upgraded to do this work-around. After synching from iPhone to web. I am NOW able to synch in both directions again. I suspect this is an Ancestry problem and not an Apple problem. However for portable genealogy this is a PROBLEM. This is a case where an early adopter is fine and the person who just got his/her first iOS device and it came with iOS5 is not able to participate in the portable genealogy revolution. ANCESTRY.com when will you update your APP for iOS5 ? Stanczyk has been mired in minutia or since it is a plethora of minutia, then perhaps minutiae is appropriate. However, I like the sound of minutia, while minutiae sounds like a Japanese anime character. You see, I am mired in a mountain of minutia — even my writing has been infected by the minutia. Gazetteers is now complete (or at least no longer under construction) and is a credible resource to start your work on gazetteers. The other two pages had slight tweaks to them. I am evolving the top TABs (Dziennik Polski, Biechow, Pacanow, etc.) in true menus, with menu items. I hope this will organize my materials for faster finding and utilization and to provide for more content, easily found and to make better use of that scarce real estate at the top. Stanczyk has been trying to get his Roots Tech organized and ready to be deployed. As you know technology is slippery as an eel and hard to master/muster into a kind of electronic Swiss knife. My focus is portable genealogy — taking my research & tools with me into the field (uh, libraries, archives, churches/synagogues, courthouses, vital records offices, and cemeteries). So the smartphone and the cloud have been an emphasis. My latest tool in my bag of tricks is the iPhone app: ImageToText . This little application allows you to take a picture of a page of text, it recognizes the text (in the picture just taken), and then you can email that text to yourself (or anyone else really). So now you do not have to scribble down that paragraph of text or that page from a city directory. Just (1) start ImageToText, (2) Take a picture, (3) Send an email. What comes to your mailbox is NOT the image but OCR’ed (OCR is optical character recognition) text in the body of the email message. I like that a lot. I have mentioned this a couple of times before. It was a concept that was coming. It came. OK I tried it, but I could not use the first implementation because they could NOT return a list of MY Family History Centers (why would I want to order a microfilm that was only for other states, i. e. UT). Ok ,they have finally fixed their problems and I can now report that My Account is working. So go to familysearch.org/film and create an account, set it up and start ordering microfilm. https://www.familysearch.org/films/customer/account/ – Keep this handy (Bookmark it / Make it a Favorite). This is the link to your Microfilm/Account Dashboard. Stanczyk was reading his emails, when he noticed Ceil Wendt-Jensen has published a useful website on the various Polish / Michigan genealogy mailing lists. As the Article title suggests this is another database of military personnel from World War I. This one is unlike the ones you’d find at genealodzy.pl . It is however, similar to these databases and even links to the same Fallen in World War I website. But as I said this website/database is different from those. The aim of the Prussian Army project (link: http://www.genoroots.com/eng/databases.php) is to provide an easy way of searching through the Deutsche Verlustlisten. This is the Prussian Army’s Personnel Losses during World War I .
e-mail: prusy22@wp.pl. When asking for further information, you must provide the ordinal number (‘L.P.’), the first and last name and the rank of the person in question. The additional information costs 2 Euro per name (=$2.82 as of 10/27/2011), payable via PayPal (to prusy22@wp.pl ). Stanczyk is not affiliated and has no conflict of interest in these entrepreneurial Poles. I did not find any of my ancestors, so I cannot tell you what details you may find. 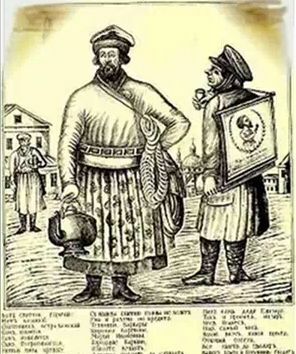 My ancestors were from the Russian-Poland partition (and hence would have been in the Russian army) — keep in mind this Prussian army (not Russian, not Austrian). Good Luck! Please send me an email with a sample detail if you send for it. Thanks! We always salute the famous historical heroic figures like Pulaski or Kosciusko or possibly scientists like Madame Skladowska Curie and Mikolaj Copernicus or maybe a musician like Fryderyk Chopin. But I do not want this month to go by without a listing of the literary talents and the artistic talents. Yesterday I wrote about the writers and today I wanted to mention the painters and scupltors. 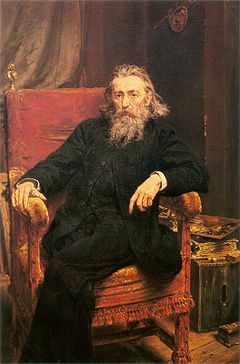 Piotr Michałowski, Jan Matejko (Stanczyk’s portrait painter — see below for self-portrait), Walery Elijasz (guess why he is in the list), Stanisław Wyspiański (also was on the list of writers yesterday too). Walery Elijasz who may or may not be related to this author was famous for his book illustrations and travels through Zakopane where he was a major part in the founding an artists colony there. If Stanczyk could get you to view one artist’s works it would be Jan Matejko (1838-1893). His home is a museum in old city Krakow and can be visited. He is the artist whose painting is at the top of this blog. You have probably seen his painting of Polish kings in books or on Polish stamps. This jester has a work of his on Copernicus (on a rooftop with his scientific tools, “Conversation with God“) that is much beloved. 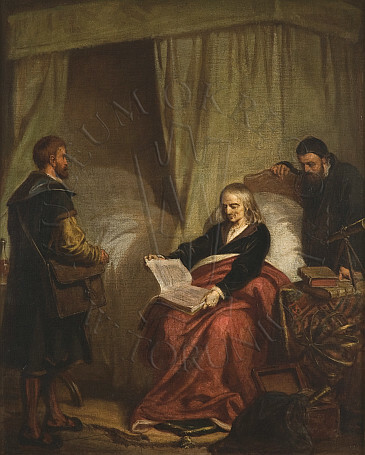 Jan Matejko also wrote a small book in Polish on the Polish kings using his artwork on them and provides a genealogical/historical sketch of each king. Besides his historical paintings of Battles and Kings, he is also renown for his portraiture. The Krakow Academy of Fine Arts where he served for many years was named for him in 1979. He was a true Master of the Fine Arts. We always salute the famous historical heroic figures like Pulaski or Kosciusko or possibly scientists like Madame Skladowska Curie and Mikolaj Copernicus or maybe a musician like Fryderyk Chopin. But I do not want this month to go by without a listing of the literary talents and the artistic talents. Polish Literature is richly nuanced and uniquely Slavic. If you have read this blog for a while, you will have seen a mention of Stanislaw Lem or Czeslaw Milosz and a few others. There are so many to choose from: Mikolaj Rej, Jan Kochanowski, Adam Mickiewicz, Juliusz Slowacki, Henryk Sienkiewicz, Stanislaw Wyspianski, Wladyslaw Reymont, Stanislaw Witkiewicz, Wisława Szymborska or Slawomir Mrozek. For more information, please click on “Polish Literature” or my favorite website for Polish Lit: Staropolska . 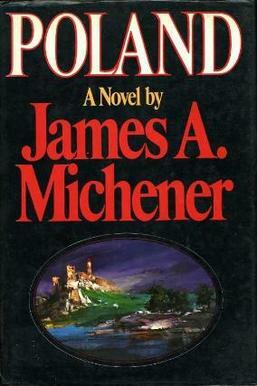 Today’s article is on James Michener’s “Poland“. Michener may not be Polish (he never knew who his biological parents were), but he is another of those great local literary talents of my adopted hometown of Philadelphia. This book is a historic novel with some fictional literary devices utilized to stitch together a coherent narrative around ten historical topics of Poland. These ten episodic chapters can be read straight through or sampled individually. If you only read one chapter this month, of this easy reading novel, then read chapter five (on Jan Sobieski and his heroic salvation of Europe at the Battle of Vienna). They probably sung a hymn / poem from the early 14th century, called Bogurodzica (Mother of God) which is the oldest poem in the Polish Language. You can hear this fascinating hymn here . This poem has no Latin equivalent, so it roots are entirely Slavic. By the way, you may want to read Czeslaw Milosz’s book, “The History of Polish Literature” for more background on today’s article, including Bogurodzica. Tomorrow … A Selection of Artists. You may want to read Donna Pointkouski’s Top Ten More Ways To Celebrate Polish Heritage Month for more ideas on this month of ours. Stanczyk, is feeling very home-centric these days and many familial events (genealogy progresses). 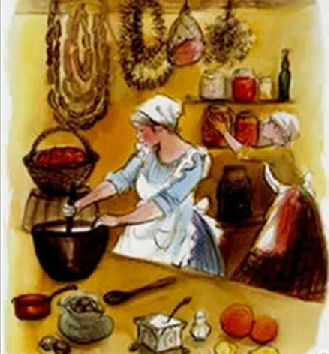 As the weather now turns to autumn, thoughts of baking and fine cooking come to mind — who does not revel in the warm, fragrant baked goods of the season. Polish Bakery Food is good for the soul … and so is food for thought, good for the soul too. Stanczyk combs through the dusty catacombs of the Internet seeking. Seeking what … I do not know. But here are a few pictures to warm your thoughts. I have mentioned before that this jester is a bibliophile. So when I found a website (http://arcaion.cba.pl/) about Documents, Books & Lettersin a digital form, I was fascinated. It is written in Polish and other languages, but you can select ‘English’ at the top left and much of the text (including Tag Cloud) convert to English.I like this site enough that I am considering adding it to the blogroll. What do you think my faithful readers?I think I approve of this erudite author’s penchant for interesting and wide-ranging topics. I found that s/he chose. I was interested in the Ming Virtual Manuscript Room (University of Birmingham, England) and the collections of documents they have from the Middle East.If you go back to December 13th, 2010 you will find an article on “Ex Libris / Bookplates“. The link (URL) to that blog’s website, which was chock full of interesting articles — sadly none new since 2009. I loved it so much, I am considering “ripping the web pages from the defunct website? ?” to my hard drive so I do not lose that author’s research which was so rich and robust.Somewhere amongst the original website I was speaking of, is another link to a website of ancient French maps (rather ancient maps collected by National Library of France). 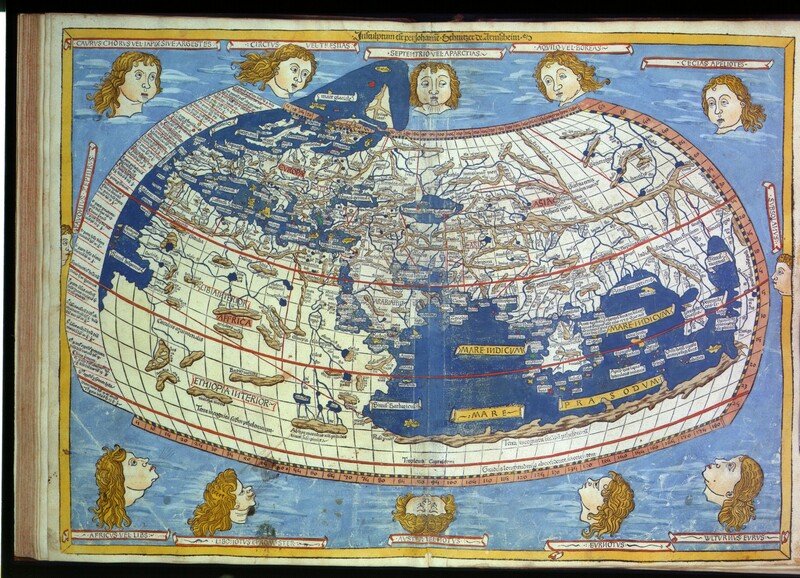 I was intrigued (is there such a thing as cartophile — for map lovers) by a map purported to be from the 15th century that captured the Ptolemaic View of the World Map. There was another fine article on the oldest documents in the Suwalki State Archive. I will definitely have to check in on this blog and either add it to my blog roll here or at least add it to my iGoogle page for genealogy so I can keep tabs on the new articles of interest. Oh, the artwork on the left side of today’s article — they are from You Tube videos on Poland or Yiddish Theater in Poland. But I felt they capture my mood for this autumnal Monday. Enjoy with your morning coffee (how about some Sumatra) ! I am hoping for quick improvement. If you read nothing else then you have the gist of it. Where’s the Locked iPhone Photo Taking Ability? LONG download of 768MB (about 3.5+ hours). Perhaps it will be less in a few days after all early adopters have had their chance at downloads. My contacts came over OK, even ones I had done recently. You must be there at the iTunes App and with iPhone to handle initial configs and ok licenses. This is a hardship when it takes 3.5+ hours to download and more time to update the iOS. Do not walk away. I do not KNOW what would happen if you lost connection during the 3.5+ hours of download or during the time updating the iOS and configuration. You may need to do a restore or possibly re-start download ??? 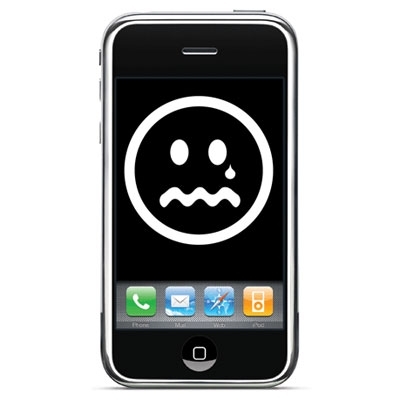 I am NOT updating my wife’s iPhone because she is less willing to be an early adopter and fight through the issues. I would NOT hurry to update if you have iPhone4. There is not enough value and too many issues, plus you lose zoom on camera APP. The Email issue reminds me of the BlackBerry woes. My email still comes/goes, but it is slow and the connection tom Email provider is inconsistent. Sometimes, the first two lines do not fully appear on all messages. What gives? This all worked perfectly in iPhone4. The EMAIL app issues is what gets me to recommend that you DO NOT UPGRADE yet on iPhone4. Also if you need zoom on the Camera APP then do NOT upgrade. The niceties are too little to be worth the issues. #Genealogy – Are All of Your Ancestors in the Will? Family Chronicle magazine (September/October 2011 issue) has a couple of interesting articles in the current magazine . Eastern European Research Made Easier! This last one caught this jester’s eye. We spend so much time on this research and perhaps even hire other genealogists to assist us, so there is a very good chance that the information you have collected might not be able to reproduced or it may no longer be cost effective to reproduce. So where are your family tree and source documents going when you have departed? Many local libraries or archives take Family Histories. For example, the Historical Society of PA (HSP.org) has a room of family histories (you should visit it) and if you have written a self-published book make sure a copy goes to your local library. You should also make sure that other locales you or your direct line family have lived also have a copy of your genealogy. In my case, I will do at least the State of MI Library , and HSP and probably Toledo Public Library. I may consider Buffalo Public Library (their Grosvenor room) and perhaps Mt Clemens, Public Library too. What about the Source Documents (Birth/Death/Marriage/Nat’l Certificates? Bibles? Do you have someone in the family that REALLY wants these heirlooms? I hope they are reproduced in your self-published book. Send gedcoms to other genealogists who are family or interested in your family trees. I do this almost annually as a means of backing up my research to CDs and sending them to these remote family researchers; its a good offsite backup. You can put them in EMAILS, Write a CD (with copies of the source documents — fill up the 680+ MB) with the gedcom, use the Internet (Cloud anyone?) — for example use DropBox or Google’s Cloud and grant READ access to other genealogists and interested family members. That’s my musing for today. I am truly interested in what you are doing. Drop me an email or leave a comment. I am sure other genealogists are thinking about this or perhaps need to be thinking about this. Oh, have you documented your life too? I think a lot of genealogists, spend time on everybody else but themselves in the family tree. Do not forget to document your life. Make sure your Will reflects the donations if you do not accomplish them while you are amongst the living. Give considerable thought to your heirlooms. What happens if the intended person pre-deceases you? Make sure your contingencies are accounted for. I do not know about you, but I think I will read Patti R. Albaugh’s article and do some thinking. In the USA, we celebrate Columbus Day, the second Monday in October. The actual day is 12-October-1492. Latin America too celebrates this holiday. It has been a federal holiday since 1937. However, I did not say national holiday as three states do not celebrate the holiday at all. Alaska, Hawaii, and South Dakota are the three states that do not recognize Columbus Day. I hope Columbus’ roots can be determined scientifically, just as Copernicus’ remains were identified and resolve this hoopla over Columbus’s Heritage. In my last article, I spoke about UKASE = Decree. Today, I wanted to write about another Ukase. By the edict (ukase) of Czar Peter the Great on December 18, 1708, he divided Russia into eight guberniyas. 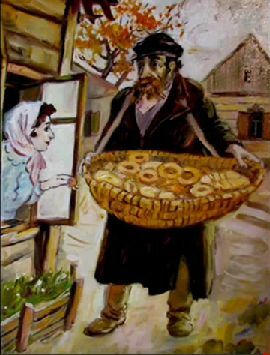 A Gubernya (aka Gubernia) is roughly equivalent to a State in the USA or a Province in Canada and is very equivalent to a Wojewodztwo in Poland. Gubernya is a Russian word and is written in Cyrillic as, губерния . The number of Gubernya and the area they covered changed over time. So if you check out the map from my MAPS page from 1820, my ancestors would have lived in the Krakow gubernya. 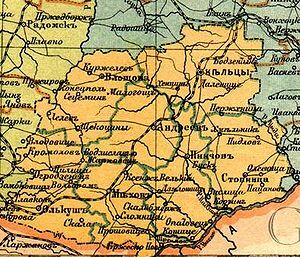 But by my grandparent’s time they lived in the Kielce (aka Kieleckie) gubernya — no their village of residence did not change, but the Russian Administrative regions had been re-defined a few times. A good Gazetteer should be able to give you the Gubernya for your ancestral village. Knowing the administrative region may help you locate where the records are for your ancestors. Obviously, you should check their parish first. But you will also want to know the region to locate the civil or religious archive that might have backup records (vital records, court records, military records, voter lists, etc) for you to research. Also you should know the Russian, as well as the Polish words and spelling of your ancestor’s residence(s). If nothing else, so that you can Google for data on the Internet. The results you get from Googling “Gubernya” will be different the results you get from Googling, “губерния“. Trust me the “orange-ish” area is Kielecka Gubernia. Near the bottom-right you will see Stopnica and Pacanow (стопнйча, пачанов). Stanczyk, likes using Goggle technology for genealogy. I use Google’s Translator to translate Russian/Polish/German/Latin to/from English. I use Google Books for hard to find reference materials. I use iGoogle to create a personal “Genealogy-Newspaper” to read every day and also add a few genealogy widgets too. I use Google Maps to create cemetery maps with data. Obviously, I use Google as a search engine. Now I use all of these tools on my smartphone. 6:20 pm Jeffersonville Township Public Library will hold two genealogy classes in October in the library’s Gates Computer Lab, 211 E. Court Ave.
and PBS’ “Faces of America are helping fueling the trend in genealogy. But for many Hispanics, tracing the family tree hasn’t been so easy. When they run into those inevitable brick walls in search of their ancestors, more and more genealogists are turning not to census data, military logs or death notices. IRON RIVER—On Thursday, Oct. 6, the Iron County Genealogical Society will meet at 1 pm in the J. Patrick White Conference Room at the West Iron District Library. A five-part series of beginning genealogy starts Thursday, Oct. 13 at the Jackson County Genealogy Library, Phoenix. Virginia and Pennsylvania are considering easing restrictions on vital records in response to pressure from genealogists, and are soliciting comments from researchers. By Anonymous The annual noon luncheon meeting of The Genealogy Society of White County, Illinois will be held Oct. 29 at the American Legion Hall in Carmi. Traditionally, genealogists have been forced to manually re-enter vital information, such as names, dates and locations, on every site they visit for every person in their family tree. The South Plains Genealogical Society will feature George Schweitzer as speaker for its Fall Seminar from 9:30 am to 1:20 pm Oct. 8 at First United Methodist Church. A free basic genealogy workshop is scheduled at the Yuba County Library, 303 Second St., Marysville. The program is slated from 2-5 pm Saturday. FORT PIERCE – Local historian and genealogist Patti Kirk is returning to the Morningside Branch Library with her genealogy series for October. “Genealogy is so simple and easy to do that it can be done in five minutes.” That’s the very misleading introductory remark on a video on the popular Mormon Church website, FamilySearch. He started out with a modest interest in his own family genealogy, but when Jerry Becker was done, he had more than 800 names on the family tree and relatives from around the world meeting each other for the first time. But without a lot of experience, those new to genealogy might not be sure what materials exist, or how or where to find them. Genealogy Dept. Tours: Learn what is available for family history research. IRC Main Library, 1600 21st St., Vero Beach. Tuesdays and Oct. 15. Yesterday’s Pulaski Day Parade (10/2/2011 Philadelphia) was another event in the Month long celebration of Polish American Heritage Month. This year there is a focus on Polish Scientists and in particular, Madam Curie, whose 100th anniversary of her 2nd Nobel Prize (November 2011). 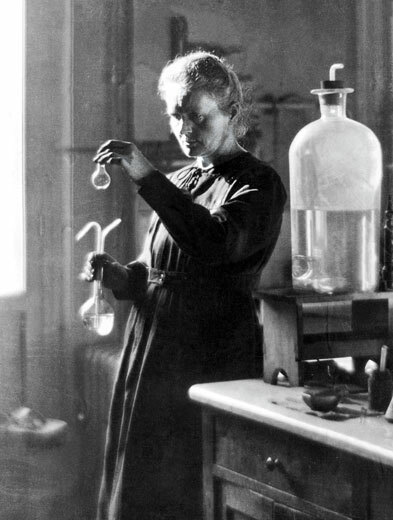 Marie Sklodowska Curie was the first scientist (man or woman) to win two Nobel Science Prizes. I believe only Linus Pauling has equaled her achievement. Stanczyk‘s favorite magazine, “Smithsonian” (October 2011), also has and article on this amazing scientist. Please honor the month and the woman by reading this fascinating article, “The Passion of Madame Curie“. Remember, to honor Columbus Day and any of its parades with your Polish flag. In the last year it was reported by a Portuguese researcher (Manuel Rosa) that Christopher Columbus is really a Polish son (and not Genovese). So this is new Polish Heritage we need to celebrate. This blog has a couple of articles (here is the original article). I will start with my paternal grandparents since I know their parishes in Poland. In Biechow, my grandmother Walerya’s parish is named: Wszystkich Świętych (All Saints). This is the parish where my grandparents were married in 1907. It is also the parish where their first child (Wladyslaw Jozef) was born in 1908 and probably Aleksandra (aka Alice) was born in that parish too. Aleksandra came with my grandmother in 1913 to the USA as a four year old. My grandfather, Jozef Elijasz, was born in Pacanow, in the sw. Marcin (St Martin) parish. Once Jozef and Walerya came to the USA, they left a trail of churches, with family notations to dot the landscape across this great nation of ours. 1913-? Depew, NY – St. Augustine. Jozef & Walerya had their third child, Casimiera (aka Catherine) in 1914.
? (post 1914, but before 1916)-1920 Toledo, OH – St. Anthony. In 1916 Their fourth child, Stefan (Stephen Edward) was born. Followed by Joseph in 1919 and Boleslawa/Bernice in 1920. Stefan and Joseph were christened at St Anthony, but Bernice was not christened in the diocese of Toledo. So I think that almost immediately after Bernice was born they moved to Detroit and I suspect Bernice was baptized in Detroit. Detroit, MI – So many parishes. In Detroit, December 1922 Henry was born. Henry was born and died a month later in January 1923. In 1924, Theodore was born in Detroit. Finally, In 1926 their last child, Chester, was born at home. His baptism was at Corpus Christi Church (2291 E. Outer Driver, Detroit) in 1928. My grandfather Josef built the steeple on Corpus Christi Church. Chester’s God Mother Janina Leszczynska is a mystery. Was Janina a sister or a sister-in-law of my grandmother (Walerya z. Leszczynska) ? We have no record of Janina Leszczynska — perhaps the 1940 US Census will shed some light. Chester attended Immaculate Conception Church in Hamtramck as a boy. His 1st Holy Communion was at St Johns Church on East Grand Blvd, Detroit. So that is nine children born and seven who survived infancy. My grandparents had children in two different countries, and in three states in the US. Two churches in Poland and at least a half dozen churches in the US document my father and his siblings births/baptisms.